A drizzly grey day after yesterday’s pouring rain, having spent the morning inside we went out for a ride in the early afternoon to take a look at the City of Monash “Skink Link” habitat works along Scotchmans Creek. I’d seen one of the piles of logs a few times while riding past but hadn’t stopped to look in detail, and in describing it had managed to confuse Jo, since she’d received email updates about the work, but it placed them on the other side of Drummond street. 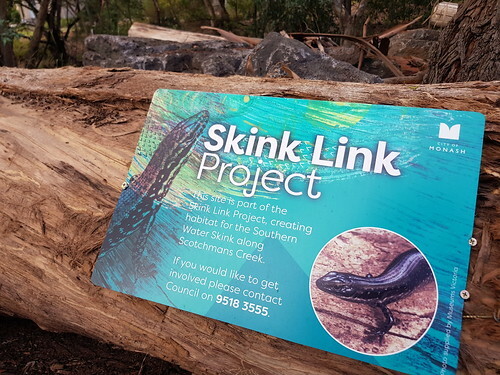 Well it turns out that there are at least two “Skink Link” habitat constructions, one between Atkinson and Drummond streets and the other across Drummond street near the playground. Both have signs explaining what they’re for, I hope they’re effective, but I see a few too many off leash dogs along there so I suspect there’ll be a lot more dogs digging around and chasing wildlife than the council would like. There was also a sign telling us that there had been a working bee today at the Huntingdale wetlands, ending about an hour ago! 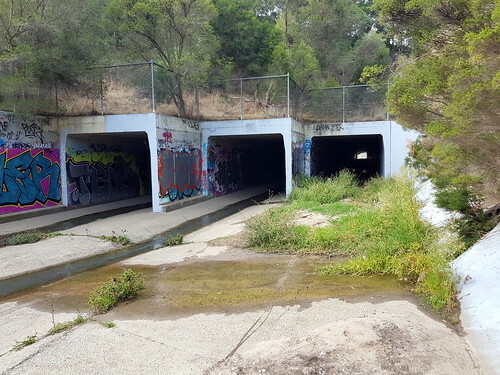 East along Scotchmans Creek trail to the Huntingdale wetlands to see if we could catch the tail end of the Skink Link planting day and although we met a cub troop out on an activity there was no sign of anyone else, hardly surprising since it was to have finished at 1 pm. Crossing Huntingdale road was a problem, yesterday’s 25mm of rain had washed out huge quantities of mud, silt and sand – as always – that had accumulated across the end of the bike path and made for a slippery and dangerous path, not helped that it is placed where you have to turn 90° from ramp to path alongside the road. From the upstream end of the wetlands a brief exploration along the dirt road beside the creek. While I’ve ridden along there in the past, the other two hadn’t and weren’t aware that it existed. 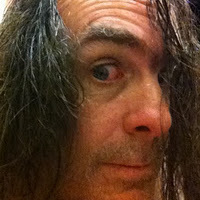 We slipped and slid as far as the Monash freeway. 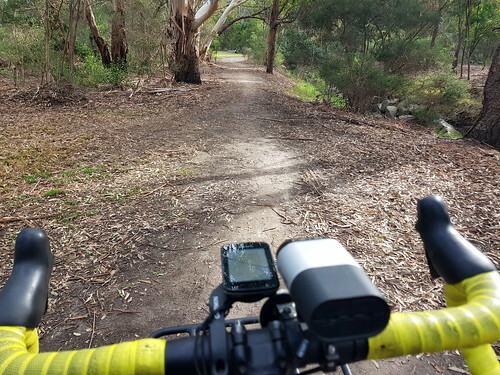 It’s an odd dirt road – with the addition of a bridge over the creek or a restructured crossing under the freeway this could have been the main route of the Scotchmans Creek bike path and would have been shorter, more direct, and would have lined up better at the end of the Huntingdale wetlands, unlike the current routing that has two sharp 90° turns on and off a very narrow concrete path. Hardly surprising that in typical bike path fashion the less usable route was chosen. Then five or ten minutes hunting unsuccessfully for a geocache, the GPS in the phone had me bouncing around from 2m to 65m away, no luck today hunting in endless piles of fallen branches and mud. Home back the way we’d come, detouring for a lap of Brickmaker’s park to see how the pond was looking after the rain and staying out just that little bit too long, so the last five minutes home were as the rain started to fall again.